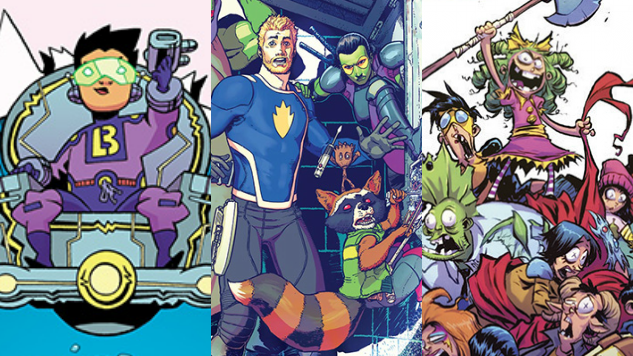 The first Saturday in May marks Free Comic Book Day, a celebration of the direct-market comic world, in which participating stores offer oodles of sequential-art awesomeness to fans new and old at no charge. The intent of the annual event is to share goodwill and enthusiasm for the medium—publishers and retailers (who still pay a fee for each copy) aim to pull in new audiences to enjoy an art form that receives criminally less support than the millions-grossing films based on its characters and storylines. If you’ve got a participating shop within reasonable distance, there’s little excuse for missing this day-long comic bash. Montreal indie publisher Drawn & Quarterly is sporting a particularly strong FCBD game this year, with two comics that demonstrate the breadth of its publishing strata. The first floppy offers a sample of Guy Delisle’s harrowing graphic novel, Hostage, a biography of a charity employee’s captivity and escape from captors in Chechnya. The entry also includes a preview of Brigitte Findakly and Lewis Trondheim’s upcoming Poppies of Iraq, an autobiography from Findlaky about her intense childhood in Mosul.